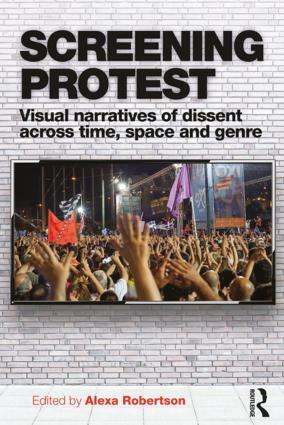 Screening Protest brings together a range of scholarly perspectives on the study of protest mediations on television and in film. Arguing that the screen is a fruitful, if overlooked, analytical focus, the book explores how visual narratives of protest wander across borders – territorial, temporal and generic. Chapters compare coverage of major protests in recent history by global news channels like Al Jazeera English, BBC World, CNN International and RT. They consider how geopolitical agendas, newsroom culture and the ubiquity of eyewitness footage shape the narration of events such as the ‘Umbrella Revolution’ in Hong Kong, anti-austerity protests in Greece, pro-EU mobilizations in the Ukraine and clashes in Ferguson. A focus on narrative allows authors to compare such news stories with popular cultural depictions of the protester, in films and television series such as The Hunger Games, Robin Hood and Suffragette. Although focussed on the screen, the scope of the book is broad, given its exploration of images distributed worldwide. Written with both scholars and students in mind, Screening Protest will interest researchers in political science, sociology, media and film studies, as well as the general reader interested in current affairs.